Boxing Insider – Miguel, how do you feel about your fight with Gamboa this Saturday? Miguel Beltran Jr. – I feel ready, I feel good. We had a great preparation, a great training camp. Now we’re just waiting for the day of the fight. We’re ready to go! Boxing Insider – In this training camp, what did you find difficult in preparation for this fight? Miguel Beltran Jr. – We had a lot of rounds of sparring. Mondays, Wednesdays and Fridays we had tough and intense sparring. But we are ready and in good rhythm come fight night this Saturday. Boxing Insider – with Gamboa’s previous experience of being a gold medalist in the Olympics, being an ex-world champion. How difficult do you feel this encounter will be? Miguel Beltran Jr. – I feel it’s going to be a great fight because of our styles of fighting. And to tell you the truth it motivates me to fight someone like Yuriokis Gamboa because of the name and trajectory he has built himself. He doesn’t intimidate me though and come Saturday we will leave it all in the ring so we can come out victorious that night. Boxing Insider – Many feel that Gamboa’s chin can be questionable, will you be going for the Knock out? Miguel Beltran Jr. – Yes, but more than anything we prepared in camp for an intense 10 round fight. If we’re able to finish the fight early than great, we welcome that. If not then just know we are well prepared to give a great fight from the opening of the 1st to the end of the 10th round. 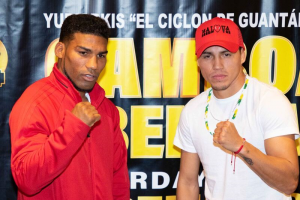 Boxing Insider – What is your plan to get Gamboa to fight your kind of fight? Miguel Beltran Jr. – To keep closing the distance on him and keep constant pressure because we know we have everything against us in this fight, that we basically need a knock out to win the fight. Boxing Insider – Looking past this fight a bit. Do you feel that with a victory over Gamboa, would that put you on a level to compete with the other big names in that division? Miguel Beltran Jr. – Yeah for sure! In fact, I’m willing to fight with whoever. I’ve never turned away from anyone nor am I afraid of anyone. But above all I don’t really like to talk a lot. My focus is on Yuriokis Gamboa and if all goes well and we get the victory then we’ll talk about what rival we want next. Boxing Insider – Gamboa has been inactive for nearly a year now, you have had one fight this year against Misael Munoz who you stopped. Do you feel that Gamboa’s inactivity is going to work in your favor come Saturday night? Miguel Beltran Jr. – Inactivity tends to have an effect on all fighters. I prepared to win this fight. My team and I are aware of his inactivity and it could have an effect on him, but either way we had a great training camp and we’re ready for war. Boxing Insider – Any final words you’d like to say to your fans and all those that support you? Miguel Beltran Jr. – Thank you for supporting and to continue supporting us. I’d like to give a big shout out to all the Mexican people that are going to be with us that night and most of all a huge shout out to my family. Miguel Beltran Jr. will be going head to head with Yuriokis Gamboa in a 10-rounder lightweight bout live on PPV Saturday Nov 10, 2019. Also on the card will be Juan Manuel Lopez(35-6 32kos) taking on Cristian Mino (19-2 17 kos) in another 10-rounder bout. Tune in for another exciting night of boxing.